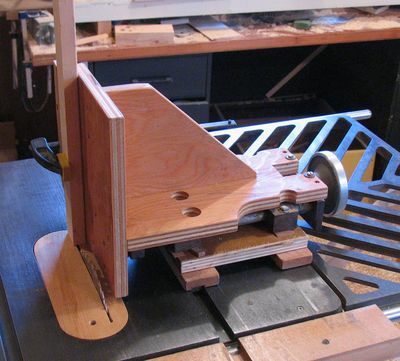 For making mortise and tenon joints, unless you want to spend serious money, a simple tenon cutting jig is the best way to go. This tenon cutting jig is my second jig. Building this one was made possible by a yardsale find of some parts of some sort industrial something or other, which consisted of two 5/8" steel rods, and a thread that went between them. It was just what I needed for lateral adjustments for a tenon cutting jig. And the screw on it is exactly 10 turns per inch, which allows calculation of tenon thicknesses relatively easily. 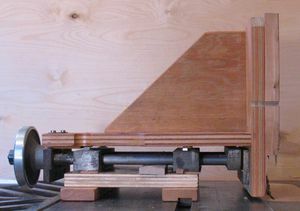 The tenon cutting jig rests on two wooden runner on the table saw. The right one of these has a 5/8" x 3/8" steel bar in it, to run along the slot in the saw. On top of the wood runners is a piece of 3/4" plywood, and on top of that are mounted two of the steel blocks, which have two 5/8" steel shafts running through them. The knob on the left side is attached to a lead screw which runs the length of the jig. It engages a thread in one of the blocks, so when the knob is turned, the lead screw is screwed left and right, and pulls the rods and blocks on the end of it with it. I drove a small wedge between the base plate and the steel rods to give the mechanism more friction, so it wouldn't move on its own. The top assembly is just plywood to rigidly hold the plate on the right upright. 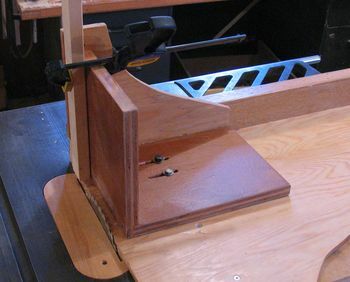 Its solid enough that my main limitation in using this jig is the height of the ceeiling above the table saw. If you want to build a tenon jig, of course, you are unlikely to come across exactly what I found. But my first tenon jig was much simpler. The simple jig worked pretty good too, but making adjustments to it was more effort. The jig is held onto the sliding table gadget by two screws, which screw directly into the 5/8x3/8" steel bar at the bottom of the sliding table gadget. Adjusting it means loosening the screws, tapping it in place, and tightening the screws again. But once its set up, it works just as well as my fancier jig. 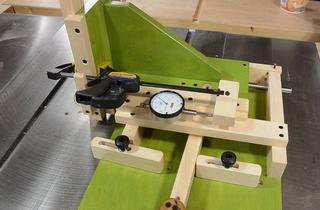 A tenon jig has more uses than just tenons. Anything really that requires a slot to be cut into the end of a piece of wood lends itself to a tenon jig. For example, I used it to cut the slots in the miters for my miter joint page. When I bought my new Delta table saw, it came with the Delta tenon jig. I used it a few times. Its better in some ways that my home made jig, but inferior in other ways. But since then, I have made much better home made tenon jig.